To fight the bacterial contamination in International Space Station,scientists found a new silvery space shield that would protect the astronauts from super-bugs. Extreme spaceflight conditions can force these bacteria to toughen up, while simultaneously lowering the immune defences of the stressed, isolated crew. “Spaceflight can turn harmless bacteria into potential pathogens,” said Elisabeth Grohmann of Beuth University of Applied Sciences Berlin in Germany. 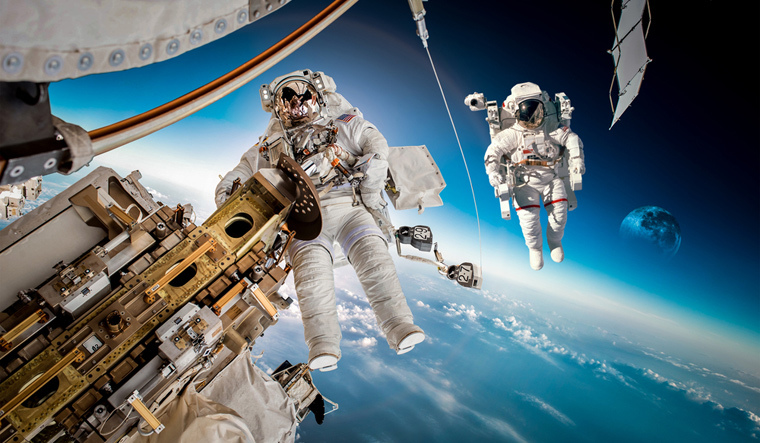 “Just as stress hormones leave astronauts vulnerable to infection, the bacteria they carry become hardier—developing thick protective coatings and resistance to antibiotics—and more vigorous, multiplying and metabolising faster,” said Grohmann. The noval anti-microbial coating is considered as a breakthrough in medical invention. “The anti-microbial coat,AGXX contains both silver and ruthenium, conditioned by a vitamin derivative, and it kills all kinds of bacteria as well as certain fungi, yeasts and viruses. The effects are similar to bleach—except the coating is self-regenerating so it never gets used up,” said Grohmann. Silver on its own has been used since prehistory to prevent microbial growth. Today it is found in everything from socks to swimming pools—which is perhaps why resistant bacteria have begun to emerge. AGXX is one of the latest attempts to reinvigorate this ancient antimicrobial, researchers said. “After six months exposure on the ISS, no bacteria were recovered from AGXX-coated surfaces,” Grohmann said.